I have been trying out a few products from Amie’s line of skin care products. So far I have liked everything I’ve tried and you will be seeing some more reviews of this line soon. I am about half way done my bottle of Amie Bright Eyes Very Gentle Eye Make-up Remover and really like it. My go-to makeup remover for the past few years has been the Sonia Kashuk Remover and Amie’s works just as good. Amie’s Bright Eyes Very Gentle Make-up Remover is made of 98.9% natural ingredients and has a gentle formula that is easy on the eyes. The remover is 100% oil-free and terminologically tested. It is also free of parabens, sulphates, mineral oils, petrochemicals and animal extracts. This makeup remover is safe to use if you are a vegetarian or vegan. The meadow cornflower and chamomile sooth and decongest while the grape water cleanses. The cucumber then helps hydrate and refresh. Amie’s is a UK brand and is available at Shoppers Drug Mart in Canada. I think the bottle runs for $7.99 Canadian. It is £4.75 on their website and you get 125 ml of product in the bottle. 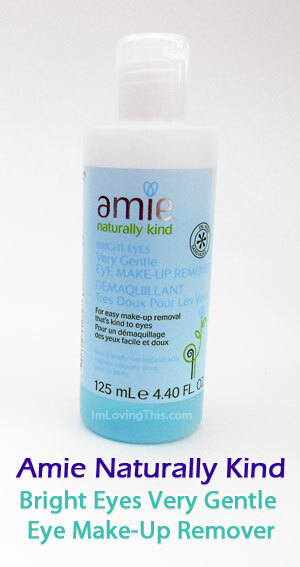 You use Amie’s remover just like any other eye makeup remover. Apply a small amount to a cotton pad and wipe make-up away gently. Repeat the process until all your makeup is removed. The eye makeup remover comes in a simple bottle. I really like the bottle as it appears that it will stand up to all my travels. The picture to the right shows my bottle as of today, so it looks partially empty but it comes full to the top. The eye makeup remover has a light scent which I can’t quite describe, it’s just a clean scent. It almost looks like windshield washer fluid as it is blue in colour. It doesn’t sting my eyes when applied like some other brands I’ve tried. It removed as much of my makeup as my usual makeup remover does. To be honest, I haven’t found a eye makeup remover that takes off every last big of my eye makeup. I haven’t worn waterproof mascara in a while so I can’t tell you how well it removes that, but it takes of my day-to-day mascara with no issues. When I wear waterproof mascara I will update this post, but I don’t have any in my collection right now so can’t put it to the test. If you need an extra pick-me-up you can keep this eye makeup remover in the fridge. If I get another cold this winter I will be popping this in the fridge for a nice cooling sensation all over my eyes. What is your favourite eye makeup remover? Let me know in the comments below. As I mentioned above, after years of wearing makeup I still haven’t found an eye makeup remover that takes off every ounce of my eye makeup.